Grace and mercy, faith and strength An interview with elder Ruth Evon - The Delta Discovery, Inc.
Ruth was born in Bethel Alaska to Paul P. Jenkins and Eileen Elena Shepherd. Ruth shares her story of her childhood memories growing up in different villages; the excitement of flying with her dad in his private airplane as well as watching a hundred dog teams racing in Bethel as a child; attending Wrangell Institute in Southeast Alaska, being far away from home for the very first time; being proposed for marriage at the site of the Children’s Home near Kwethluk while attending a one-week Youth Bible camp; the horrible tragedy of her husband being accidentally shot in the head during a hunting trip that forever changed their lives and the strength that only God gave her to carry on. Ruth also talked about climate changes within the last 5 years. Ruth Evon is 65 years old taking care of her husband to this day, continuing her faith singing and preaching the word of God. 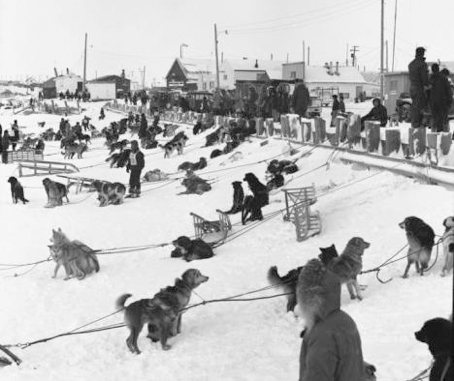 A Bethel dog race in 1969 at the riverfront. Photo by the Alaska Digital Archives collection. My first memory that I know of being aware of my surroundings was when I was probably a year old. I was in a baby jumper having lots of fun running and jumping and swinging back and forth. This was in Chefornak. I remember looking out the window watching my mom throwing a seal party. I remember we moved to a few different places. The first was Chefornak, Kasigluk, Nunapitchuk and Bethel. When I was about 3 years old my parents and I came to Bethel by boat from Kipnuk. On our way, the tide went down and we became stuck on an ocean beach. There I saw clams for the first time. Ruth busts out laughing! I ended up calling one of my relatives aliruaq which means ‘clam’ in English to this day I still call her that. After the tide went back up we continued our way to Bethel. When I was about 6 years old we moved to Bethel after my dad built a house on Mission Road. I started school here, I was in the 1st grade. I remember I barely went to school because my mom was busy taking care of my other siblings and my dad was working early in the morning with Northern Consolidated Airlines. My dad was also a pilot and he owned a private plane so I grew up flying with my dad and family. The most memorable times of flying was summer time. I loved looking out the window seeing the beautiful views. The skies were blue, the grass was green, the flowers were bloomed and the rivers and lakes were calm filled with geese, swans and ducks. My dad’s landing on the airports were perfectly smooth. Ruth’s face lit up. Back then we had dog races! People from all over the Kuskokwim and some folks from the Yukon came to Bethel. It was a big event! Everyone attended, it felt so lively with the dogs barking, children playing and most of all people cheering as the race began. There used to be 100 dog teams racing in Bethel. It wasn’t a long race like the K300, they came back to Bethel the same day. My dad participated in the race and came in 27th place. His winning prize was a box of chocolates! My siblings and I were happy to have some chocolate. Thanksgiving games was a fun event. The adult males competed in shooting the bull’s eye target. Since my dad was in the army he was expert at shooting. When it was my dad’s turn he hit the bull’s eye in one shot. He took first place and brought home a turkey. Our family was blessed to have a turkey for thanksgiving. Nowadays I don’t see any events happening here before thanksgiving. In 1960 our family moved to Nunapitchuk. I was probably 8 years old and in the 2nd grade. I remember we had no electricity and we lived in a tent temporarily until my dad moved our house to Nunapitchuk from Nunacuaq. My grandmother on my mother’s side lived with us. She took good care of the family. She made sure our family was prepared for the winter making parkas, piluguqs and sewing qaspeqs. My grandma and mom washed clothes using a washboard and a big silver wash tub. During the summer my mom used a camp and woodstove to cook our meals. During the winter we used an old fashioned oil stove to heat our home. We didn’t have a freezer or television. For entertainment my mom played records using an old fashioned wind up phonograph. For fun growing up as a child to my teenage years I grew up playing outdoors. Some of the games I played were Red Rover Red Rover, Kick the Can, Hop Scotch, and Hide and Seek. One day in Nunapitchuk many kids including myself and adults played lap game on the river and fog came in. It was so foggy we could not see but we listened for the ball to hit the ground and then we’d run after it. That was a fun day. I’ll never forget the good old days of lap game. I don’t see much kids playing lap game now. Ruth grew up with parents who served the Lord. My mom was a gifted musician, she played basically everything! Guitar, organs, Hawaiian guitar, accordion, banjo and she loved to sing. I remember when my parents bought me an accordion – that was my first musical instrument I learned to play. Later I learned to play the piano, guitar and started singing gospel songs too. When my dad wanted to he flew our family to Kasigluk just to attend Sunday service. One time during the winter my dad decided to take our family to Kasigluk for Sunday service. After we had landed he said he didn’t want to frighten us because he almost could not land. Thankfully we all landed safely and attended service. Every year we went to fish camp. Our fish camp was located below Standard Oil Road across the river not too far from Bethel. Ruth and many other kids got special treats, she smiled. It was very exciting when the 1st Husky ship and Barge would pass our camp site because they threw apples, oranges and soda on the river! People who had boats would quickly drive over and pick up the goodies and hand them out to children. During the time at fish camp my dad left to commercial fish in Bristol Bay. My cousin helped with setting nets and fished for our family. Ruth recalls when her dad returned to their camp from fishing she became ill with a fever. In fact, she became delirious which was caused from a high fever. Her dad piggybacked her to his boat and took her to the hospital in Bethel. There she was diagnosed with pneumonia. I spent 5 days in the hospital. Back then parents couldn’t stay in the hospital with their children when they were admitted. But my mom came to visit me every day. During my teenage years I was a leader in the Moravian church for youth. Right after freeze up when the lakes were clear of snow I went ice skating with the kids and served them hot chocolate afterwards. At the age of 15 I was on my way to attend Wrangell Institution Boarding School. This was going to be my first time away from family and home. On my way to Wrangell I saw Tony Evon, a man I met a few months back. I told him I would write him letters but I never did because I was too shy. The territory and climate was different in Southeast Alaska. It always rained there and when it snowed it melted the same day. I got to see deer on the lawns which was amazing. On my spare time after school I picked blueberries from trees. They were so huge compared to the berries we pick here on the tundra. The ages who attended the boarding school was 6 years to 16 years of age. The little kids there were brave. There was a lot of kids from the Yukon and Kuskokwim area. The school classes were in groups and all our clothing were numbered. My clothing number was 107. I learned how to type, read, write and learned how to use a projector in class. After 9 months of going to school in Wrangell school it was over and I was able to go home. I became so happy when he proposed to me with a ring. I said yes! That day will never be forgotten. When someone brings up the old Children’s Home site I remember Tony proposing to me. We got married in 1970 later in Nunapitchuk, I was 18 by then. After many years I misplaced my ring that Tony proposed to me with. I have no idea what happened to my old ring. Ruth remembers the exact day she met Tony. It was July 23, 1967, the day her baby sister Ina was born. After we got married we moved to Bethel. Tony and I were dorm parents in the Akulmiut Cottage before we had any children. A year after Bethel Regional High School opened, Tony and I became dorm parents for BRHS. We had 3 boys who grew up in the dorms. Tony and I worked evening shifts and we got to spend our mornings and afternoons with our kids. We continued to work in the dorm until they closed in 1980. I also worked in the library and special ed classes. In 1981 Ruth and her family moved back to Nunapitchuk and there she worked at the school. Our lives as young adults were very outgoing. Tony and I did everything together: hunting, fishing, camping, and berry picking. We loved to be outdoors. On June 01, 1983 this day forever changed our lives. It was the day Tony was accidentally shot in the head by the boat driver during a bird hunting trip. My friend and I were out fishing near Long Lake somewhere around Kasigluk. We noticed the boat driver started driving toward us and then left again but he turned back and decided to face me. He told me that my husband was accidentally shot. My heart sank and I asked him if he was still alive. He said yes and that help was on the way. While we were waiting a man and his son drove to the site where we were. He said he had heard from the CB radio that Tony was shot. I remember he took off his hat and said a prayer for Tony to live and then he left. Finally, a small plane arrived with a doctor they flew Tony to the Bethel hospital, then medevaced him to Anchorage Alaska Native Medical Center. During that time Tony had died 4 times and came back to life. By God’s grace and mercy Tony lived. I flew into Anchorage to be there for Tony. We spent all summer in the hospital. My children were taken care of by my mother. Later my 3 boys came into Anchorage to stay with my cousin Mary Anaruk Thomas. After his recovery our lives changes drastically. Tony was disabled and could not do the things he used to do. When we arrived home we were blessed with all kinds of native food, even berries. Since my husband wasn’t able to provide for us our relatives and family helped with hunting and fishing. In 1996 Tony, my children and I moved back to Bethel. There I started working at the ME school as an Associate Teacher. It was God who took care of us all these years. Even if my husband was unable to fish or hunt, family members always helped. Every year we went to fish camp I got to store away my fish. By then our sons grew up and took over with hunting and fishing including my nephews and in laws. Ruth continued to work for the school as a Yup’ik 2nd language teacher. In 2013 she decided to retire. Not long after that her husband had another accident, this time his feet got burned from boiling hot water in their steam house. Tony spent almost all summer in the hospital in Anchorage for care. While I was there with Tony, the Lord directed me to people who needed prayers too. Ruth said, through all my struggles it was the love of Jesus that pulled me through. Bad things happened but good things happened too. She smiles, it’s good to see someone who looks so lost and is found with joy and peace with Jesus. Ruth also noticed the climate changes occurring here in Bethel. Ice break up and spring seems to be coming earlier every year. Back then the ice used to break up at the end of May. Now it’s been breaking up earlier. We have warmer temperatures during the spring. During the winter we rarely have snow. Now it’s mostly ice caused from freezing rain and sleet. When I was growing up there used to be so much snow and after snowstorms kids were able to slide off from their house rooftops. Ruth says, it’s like we switched winters with the Lower 48! Down there they get more snow and its colder than Alaska. All the freezing rain here makes me worried for the roads being slick. This winter we noticed a lot of car accidents here in Bethel. We have seen vehicles in ditches, and cars colliding with other cars. Freezing rain during the winter makes me worried for the animals too. With temperatures dropping after sleet or freezing rain outside dogs are in danger of freezing to death if they aren’t sheltered at all. Our summers are different too! This summer we had more thunderstorms than before. When I was growing up my parents talked about the earth shifting and that our weather would be different. According the news, the earth has shifted and we believe it’s causing Alaska to have warmer temperatures. Earth shifting has done damages to our main highway too, the condition of the highway leading to the airport isn’t safe and I think the speed limit on that highway should be lowered because driving 40 mph with the road conditions can cause an accident. Ruth’s encouraging words are: through all your struggles the love of Jesus can pull you through. Even if it felt like my life shattered to pieces when my husband was shot leaving him disabled forever changed our lives. Jesus gave me the strength to accept what is and let go of what was. He gave me the strength and courage to raise my children and care for my husband to this day. God has a purpose for your life! Seek him and he will find you. According to the gospel of Jeremiah 33:3, “Call unto me and I will answer thee and show thee great and mighty things which thou knowest not”. Love one another as God has loved you, forgive one another and be kind. Please take care of our land too – do not throw trash on the ground, keep your campsites clean too. It was an honor to listen to Ruth’s story. Her story inspired me. She never gave up when things went wrong. Life must have been a challenge as she said, “It felt like my life shattered to pieces when my husband was shot leaving him forever disabled,” from an outgoing marriage and outgoing man to leaving him in a wheelchair and being aided by his wife. God gave her the strong will and determination to continue to care for her husband and raise her children. During my interview with her I told her that she reminded me of the book of Job from the Bible. Feeling as if she had lost so much but held on tighter to her faith. Ruth stores away her fish every year, and is blessed with great hunters in the family who provide their traditional native food for them. Vanessa Lynn Hunter is the Environmental Technician for the Orutsararmiut Native Council in Bethel, AK.